Why? is an interactive nonfiction picture book about animals that is fun. It also works as a read-a-loud (tested on the Darling Nephew, age 2, and Darling Niece, age 5 1/2); because of the scientific information, it would also be fun to use with older kids. Each page has a picture of an animal, a question about that animal, silly answers and a real answer. 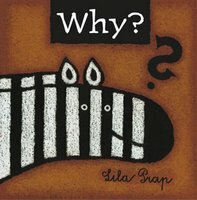 The layout of each page includes a picture of the animal, bordered by the question and silly answers; the questions and answers are in different fonts, which adds to the silliness. The real answer has a star. An example: "Why do crocodiles cry?" "They're spoiled." "They cry when they're sleepy." "They're afraid of water." "Because nobody wants to play with them." And then, the real answer: "Crocodiles are not sad, and they don't really cry, but they do like to lie in the sun. Their eyes can dry out when they are not in the water, and the tears help to keep their eyes wet and comfortable." When reading this with test kids DN & DN, it was fun to be as silly as possible with the answers. I'd read the answers as if I were asking them if it was right or not: "Is it because they cry when they're sleep?" and the DNs would answer "No". And then I'd ask them for their silly answers. And then we'd read the real answer. The endpages add another element, which it took me a while to discover (meaning, I've had this book months and realized it today). They contain a mix of animals and question marks. At first, it looks like they are repeating the animals found within the book... but when you look closer, some of the animals are silly hybrids. For example, hidden between a whale and a zebra is a "snakamel", a snake with a camel's head. I love books like this that make science fun; I also like that it almost demands conversation between the reader and the listener, so that the listener is involved; they're not passive. Originally published in Slovenia in 2003.